1. For the puree: Blend together the fruit, sugar and lemon juice in a blender until smooth. 2. For the yoghurt: Whisk together the sugar, yoghurt and coconut extract. 3. 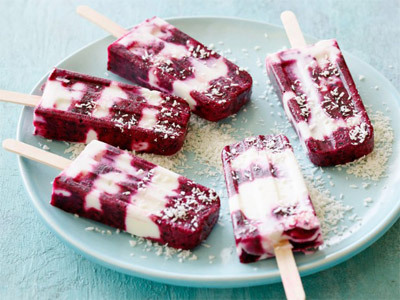 Pour alternating layers of the fruit puree and coconut yoghurt into popsicle molds, and then insert the sticks. Freeze until the pops are firm, about 8 hours. 4. For easy removal, dip the bottom of the molds into hot water for a few seconds to loosen the pops. Remove the pops from the mold, dip in coconut flakes and serve.